A leather wallet is basically a mandatory purchase as well as a valued life tool, one that you use every single day to carry round your most personal and private data, both financial and otherwise, not to mention your cards, cash and coins. Whether you're 'into' accessories or not, it's worth taking time to choose the perfect one – the state of your wallet says a lot about a person. From sleek billfolds to quirky designer card holders, these are some of the most secure and stylish leather wallets currently available. We're sure you'll find one to your liking. While wallets are not the most complicated of tools, there are certain criteria that we looked at when evaluating each one. Out-and-out style and aesthetic, while not the most important factor, is a serious consideration. After all, you don't want to go on a date to Bibendum in a tailored suit and John Lobbs only to whip out a tatty piece of cowhide, do you? And while we're talking about suits, size and compactness is another factor that needs to be evaluated for similar reasons. If you're going out for a night on the town, then a full-sized wallet might not be best option. Instead, a smaller, streamlined, card-focused affair might be a better choice. Of course, there's a multitude of other features to consider. How many cards do you need to carry? Most wallets range from two card slots, up to eight. Do you carry cash around? You'll need a cash and coin compartment, preferably zipped. And finally, there are features that go above and beyond the call of a standard currency carrier - so, for example, if you're scared of identity theft you might want a wallet with RFID-blocking security tech. What wallet will be best for you will be determined by your intended usage and personal taste, so kick back, relax and take a browse through this selection of the best wallets available. One look at this bifold wallet and you’ll be very keen to start enjoying its charms for yourself. Central to the appeal is its classic, timeless design, fashioned from pure Italian calf leather. It’s gorgeous to look at but undeniably practical into the bargain. Opened up, you get the option of eight card slots, two long pockets for all of your notes. If you're more man-about-town than romp around the countryside, then this bi-fold wallet from Burberry is the one for you. It's slim and functional, crafted from textured leather and accented with Burberry's instantly-recognisable House Check design. The wallet has plenty of slots to ensure your cards, receipts and bills stay organised, but there is no space for coins. Yes, it's on the more expensive side, but this wallet is a stylish investment which will last for years to come. Designed to be carried in the inside pocket of your suit jacket, this horizontal wallet is expertly crafted from German full-grain cowhide with unique Montblanc deep shine, chrome-tanned, dyed through. The star emblem has a palladium-coated ring for added corrosion resistance to keep it looking pristine, and there's plenty of space for your valuables. How much space exactly? You've got eight card slots, two sections for banknotes and two additional pockets for receipts and appointment cards. It might be at the pricier end of the wallet spectrum but that’s for good reason. The Mulberry natural grain leather billfold wallet bristles with stylish goodness and is resplendent in tan leather and a distinctive foil-embossed Mulberry logo. Inside, it’s a pocket-fest with the nappa lining offering up eight credit or business card slots and a sleeve for cash. You also get a brace of hidden compartments for the safekeeping of receipts and suchlike while we love the embossed Mulberry tree signature. Step into the sumptuous world of Barbour with this hand-crafted full grain leather wallet, that comes in fetching brown, or black if you want to remain low-key. It sports that classic bifold design that’s been around forever, but there are some neat variations on the theme. Inside, you’ll find a signature tartan lining, no less than eight card slots, plus two more for other slimline bits and bobs along with a separate note compartment. Icing on the cake comes from the embossed vintage branding. Storing your credit and debit cards can be an irksome business at the best of times. However, it can be done with style and ease thanks to this Smythson Card Holder Wallet. There are multiple pockets on offer once you open this 100% leather design that comes with a cool stippled effect finish, while the embossed Smythson of Bond Street logo breaks up the all black colouring. The super compact design makes it pocket, coat or manbag-friendly too. This petite and portable Tom Ford cardholder wallet is perfect for on-the-go escapades. The muted camo print is casual and stylish – ideal if you want something a little more relaxed while out-and-about. It may be casual, but this premium piece is crafted from smooth, matte nubuck leather and finished with gilded lettering to add a little class. There's enough space for four cards and a central compartment for stashing receipts and dry cleaning bills. You get the choice of a coffee or black finish from this simple-but-effective 12cm x 9cm x 3cm design from the Jekyll & Hide stable. 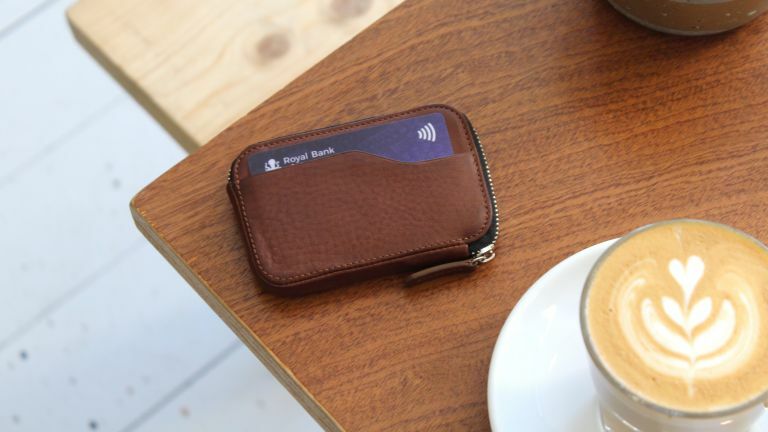 The full-grain leather finish promises hard-wearing performance while the RFID lining is designed to protect bank cards and passports from identity theft. Storage is plentiful, with no less than four card slots, two slip pockets and a handy little coin pouch that can be secured thanks to a studded closure. There’s space for notes plus a zipped compartment and the whole package comes in a cool gift box. Sometimes all you need is a classic billfold wallet, and this one from Paul Smith is one of the most stylish you can buy. Expertly crafted in Italy from the finest calf's leather, it contains plenty of slots for holding credit, debit or business cards, as well as compartments for cash and receipts. The outside is finished in plain black, while the inside is finished with brown leather and a red stipe. It's immediately recognisable as a PS piece, complete with the designer's fun and quirky sense of humour. Lend an air of distinction and sophistication to everyday transactions with Saint Laurent's Grained-Leather Billfold Wallet. The bifold style is crafted from premium grained leather alongside the brand's signature logo. Inside there's plenty of space for eight cards, cash and receipts. It's a must-have addition to your accessories collection. Store your cards and cash in this zipped wallet from Comme Des Garçons. Crafted from textured grain leather, it's smart yet casual aesthetic will go with most outfits. The major positive here is that the zip-up bifold design will keep the contents secure. Unzipping the wallet will reveal three card slots, a coin compartment and space for cash and receipts. Finding the perfect wallet is all about striking the balance between size and space, leather-goods maker Nodus think they've found that ideal balance. This is the Compact Coin. This new wallet doesn't have a large footprint, but still manages to pack a lot in. How much exactly? The Compact Coin has space for 15 credit cards (yes, 15! ), there's a coin pouch, dedicated compartment for folded notes and receipts, and, on top of all of that, a key pocket. Wallets can get grubby pretty quickly, so this hand-washable Herschel Supply Co. Unisex Wallet is a great option if you like things squeaky clean. What’s more, it has the benefit of an RFID blocking design that can fend off card skimming attempts and inside there’s a sensible selection of card slots and a pocket for loose change. There are six different shades to choose from and we love that signature red and white striped interior flourish too. Meanwhile, the one-size-fits-all design makes it a perfect gift option. Since 1904, Georg Jensen has been driven by designs that combine functionality and beauty; quality craftsmanship and timeless aesthetics. This wallet is a perfect example of that. Each item is created from leather with a stylish grey finish to create shade and shadows. Kingsman has teamed up with leather goods heritage brand Smythson to design this sleek cardholder. An easy way to keep your essentials organised, it’s made from cross-grain leather in a deep burgundy shade and embossed in gold with both of the brands' logos. If you're sick of loose change, pop Dunhill's coin case in your pocket. It's been made from durable full-grain leather in the label's London workshop in a curved shape that's perfectly suited for slipping into your trousers without disrupting the lines. It comes in an easy-to-wrap presentation box for gifting. A.P.C. 's accessories line closely mirrors the brand's ready-to-wear collect – everything is really clean and simple. This 'Walter' cardholder is no exception. Made from smooth leather, it has six card slots, as well as receipt and zipped compartments to keep all your capital in order. Slip it into your jeans or a suit jacket pocket. One of the only ways to avoid an overstuffed wallet is to opt for a slim cardholder like Polo Ralph Lauren's that only has room for the essentials. It's crafted from navy full-grain leather, detailed with a striped grosgrain tab and has the capacity for your license, store loyalty and credit cards. What more could you need? Shinola's billfold wallet is slim and malleable enough to fit comfortably in your back pocket. It's handcrafted from midnight-blue textured-leather and is simply detailed with the label's signature stamp at the front and interior – also take note of the accompanying serial number that ensures it was built to last. Loewe has been masterfully crafting leather goods since 1846, and this billfold wallet is a fine example of the house's attention to detail. It's embossed with the signature anagram, while the edges have been hand-painted for resiliency. It hosts eight card slots, two central compartments and two receipt pockets, so having organised essentials is a given. Crafted from a combination of both textured pebble grain and nappa leathers, this John Lewis & Partners card holder is a smart choice for transporting essentials discretely and in style. Complete with three card slots to one side and a transparent ID slot to the other. If you’re growing tired of owning traditionally-styled wallets and want something a little bit different then this Italian-made Bhar synthetic card holder will fit the bill. It’s got a PVC finish, which lends it an air of durability and we love the little insects that are printed onto the visible surfaces. As a result this makes the design feel almost like a one-off. Inside, there are five card slots while the 7 by 10cm sizing means it’s suitably pocket-friendly. Embossed Bally logos set things off nicely too. If you're looking for a understated but still truly luxurious, how about this card case from Launer, who includes Her Majesty the Queen, the Prince of Wales and the Duchess of Cornwall as customers. This Launer credit card case is made from premium calf leather, allowing for a soft touch but long-lasting finish. It can hold six cards with room for notes when folded. This case would be an excellent gift for a loved one or a useful piece for yourself. If you prefer something a little more colourful, Launer's newest collection feature bright interiors.